For one of our long-time customers, one of the world’s leading steelworks, we have manufactured a guillotine shear that will be integrated into an automated cutting line. The machine is able to cut mild steel up to 10 mm thick over a length of 2000 mm. This shear, however, will be used for high strength steel with a strength of up to 1500 MPa. The steelworks will use this shear within the Tailored blanks production line. Tailored blanks are pre-shaped sheets intended for stamping, especially for the manufacture of “unibody” car frames. The company supplies these semi-finished products to many of the world’s leading car manufacturers. Their peculiarity is to be formed from steel sheets with different strengths, joined by laser welding. The front part of the car must deform and dissipate the energy of the impact. The passenger compartment, on the other hand, must be as rigid as possible, to create the safety cell and guarantee the safety of the passengers. It must also be as resistant as possible to attempted break-ins. The usage of UHSS (ultra-high strength steel) makes it possible to reduce the weight of the vehicle by up to 50%, obtaining greater fuel autonomy and a reduction in fuel consumption. The difficulty for this customer is to cut the various pieces that make up the blank with high precision, to have an effective welding and without weak points. Cutting steel 6 times harder than construction steel is a challenge that few can take up. The various components of the blank must have perfectly straight edges, otherwise the weld becomes inaccurate and not very strong. The parts must have excellent dimensional accuracy. This shear will be inserted into an automated cutting line, so it must guarantee high performance and very high reliability. To achieve all these goals, Gasparini has created a unique guillotine shear. It is equipped with the Blade Pads system for maximum cutting straightness. The blank hold-downs are independent of the pressure of the hydraulic cutting system, to adapt to the material to be sheared. 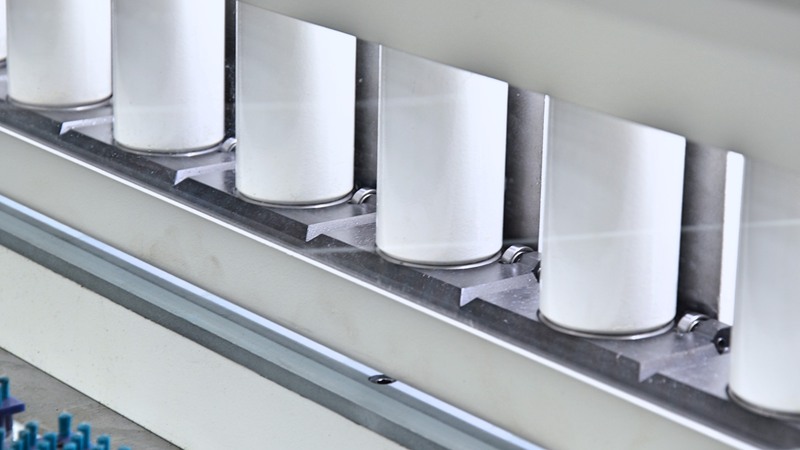 The number of blank hold-downs has been doubled to 20 elements on a linear guide, and the base has a rectangular shape for a continuous and stable support surface. Cutting length, blade clearance and cutting angle can be adjusted by CNC. 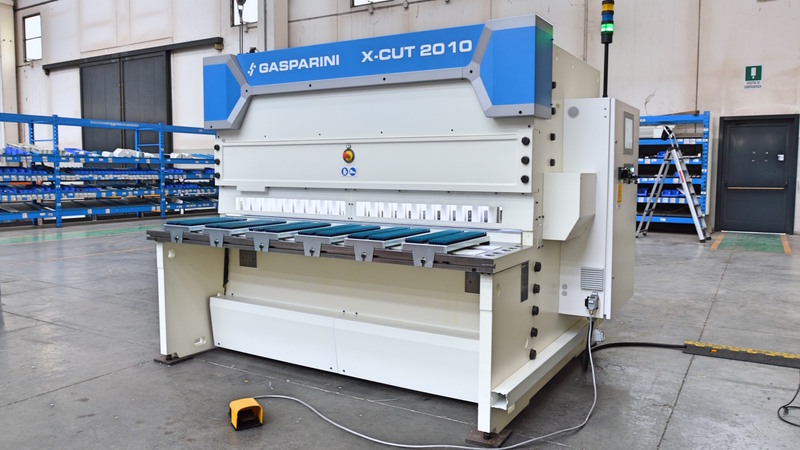 This shear is also equipped with the new Gasparini CNC with a 10.4″ touch screen and a preloaded database of materials. The CNC is equipped with an EtherCAT master capable of managing both the axes and movements of the machine, and integration with the rest of the production line. 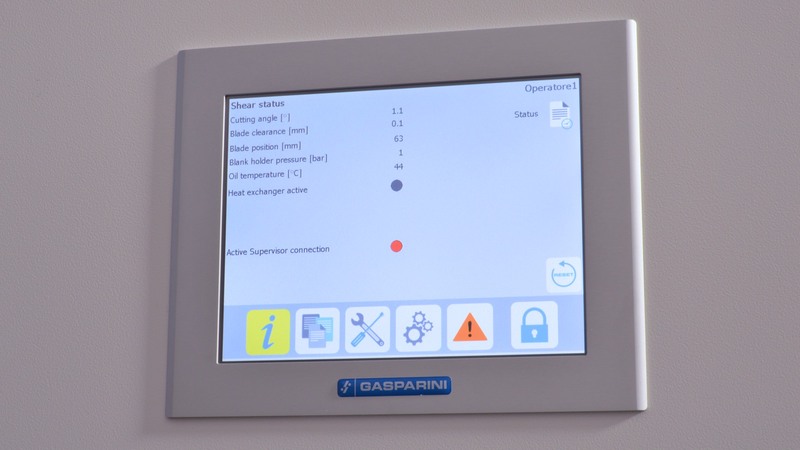 The machine has a display to show the oil temperature, while the oil level in the tank is controlled by an electromagnetic sensor. A great amount of machine status information is made available via the network, as is access to the CNC for program updates and loading. The machine is also equipped with a rear scrap basket, bench with anti-scratch brushes, and energy saving system.